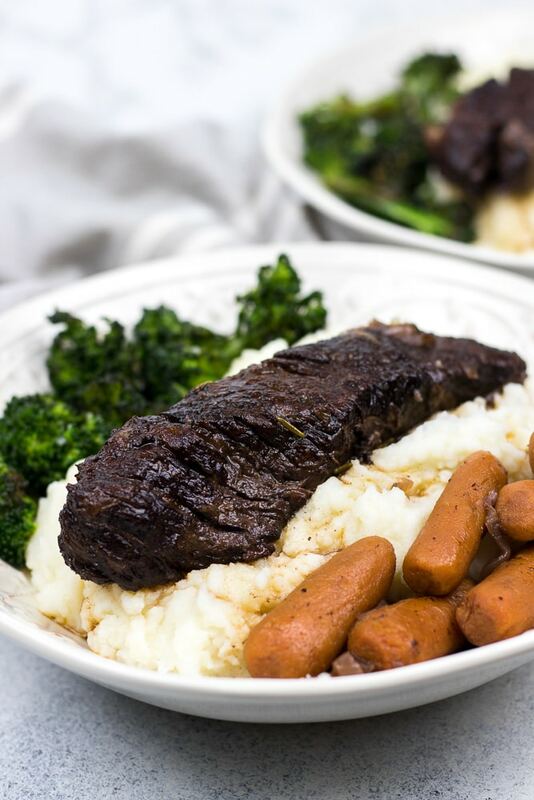 Instant Pot Short Ribs is the best and super easy recipe for juicy and tender boneless short ribs braised in red wine and cooked in your favorite pressure cooker! 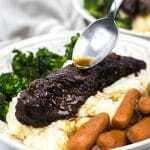 This Fall was my first time making Instant Pot Short Ribs braised in red wine sauce. For some reason I was hesitating, thinking that this recipe would be too complicated and take too much time to make. If you are making this recipe in an Instant Pot, you literally can make it in an hour and a half. Plus, it’s super easy! I went through quite a few recipes and found the best flavor combination and the easiest technique of how to make short ribs tender and juicy. The onions give all the sweetness, while the reduced red wine provides the best rich flavor. For this recipe, I like to use 2 pounds of boneless short ribs (which is 4 pieces). If you are having a bigger crowd, feel free to use 3-3 ½ pounds of meat. Though you might need to add an extra ½-1 cup of beef broth. The rest of the ingredients will be the same. 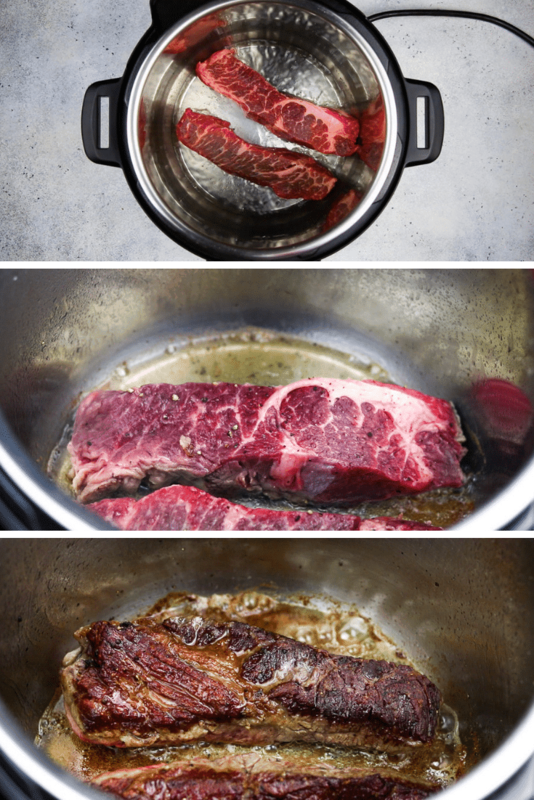 To start, wash and pat dry the boneless short ribs and season them with salt and pepper from both sides. Set Instant Pot to Sauté on high heat by pressing “sauté” button twice. Now we are going to brown the meat! This is a very important part that you cannot miss! It will give the meat that beautiful crust outside and bring out the best flavor! I like to brown the meat in 2 batches not to overcrowd the pot. Brown it for about 4-5 minutes on each side until you get dark brown crust, then remove from the pot. After it’s done, add diced onion and sauté them for about 8-10 minutes until they are translucent and have golden color. Add crushed garlic and tomato paste, stir and cook for a couple of minutes. Add red wine and cook for about 10 minutes. This is another important step! The wine needs to reduce in half and get more concentrated. It will help to give more aroma to the meat later while cooking together. When the wine is reduced, add beef broth and carrots. Put the browned meat back, so it will be halfway covered with liquid. Add some thyme and rosemary. Cover with a lid and cook on “Stew” high pressure for 40 minutes. Make sure that the venting knob is turned to “Sealing”! When it is done, let it naturally release the pressure for 15-20 minutes. Then switch the knob to venting position and release the steam. Make sure the steam is fully released and the valve is completely down before opening the pot! 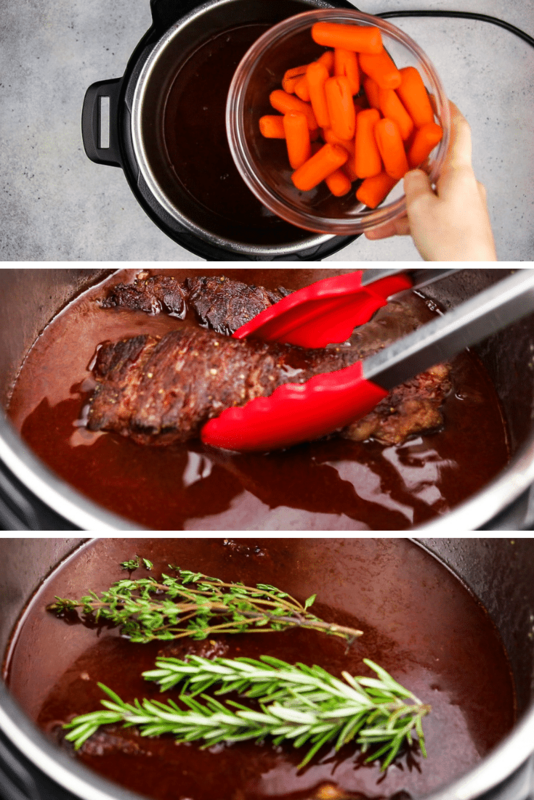 Take the meat and carrots out of the pot to a plate, cover with foil and set aside. Now we can work on the red wine gravy. Take the pot with liquid and strain it through a fine-mesh strainer in to another mixing bowl or a smaller pot. Then take that separated braised liquid and pour it back in the Instant Pot. Set Instant Pot again to Sauté on high heat by pressing “sauté” button twice. Bring the liquid to boil and cook it for about 10 minutes to reduce and thicken up. 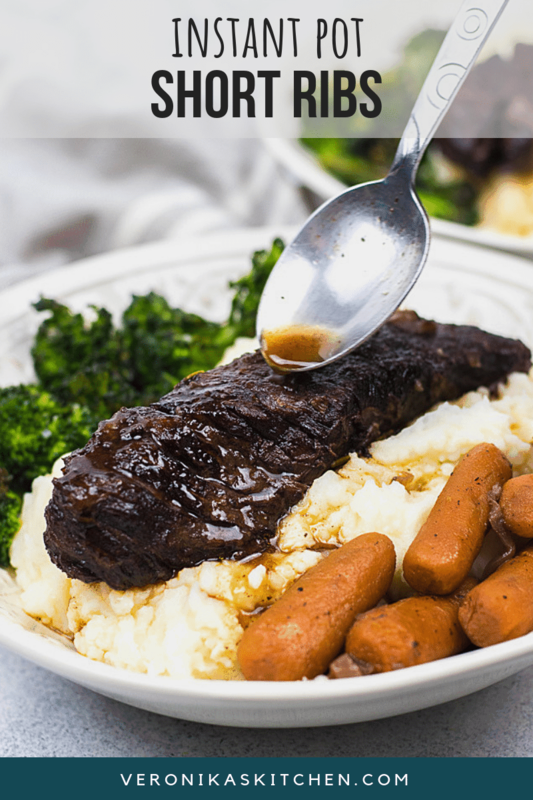 Now your delicious tender Instant Pot Braised Short Ribs are done! I love to serve it with mashed potatoes, some greens, and lot of red wine gravy on top! If you like this recipe but don’t have an Instant Pot, you also can make them in Dutch Oven. All the steps will be pretty much the same. 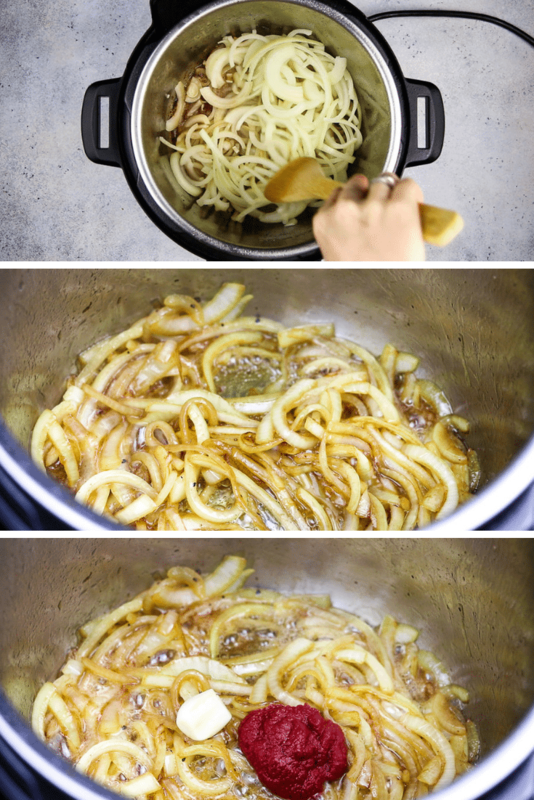 Just instead of Instant Pot, you will brown the meat and cook the onion in a Dutch Oven. 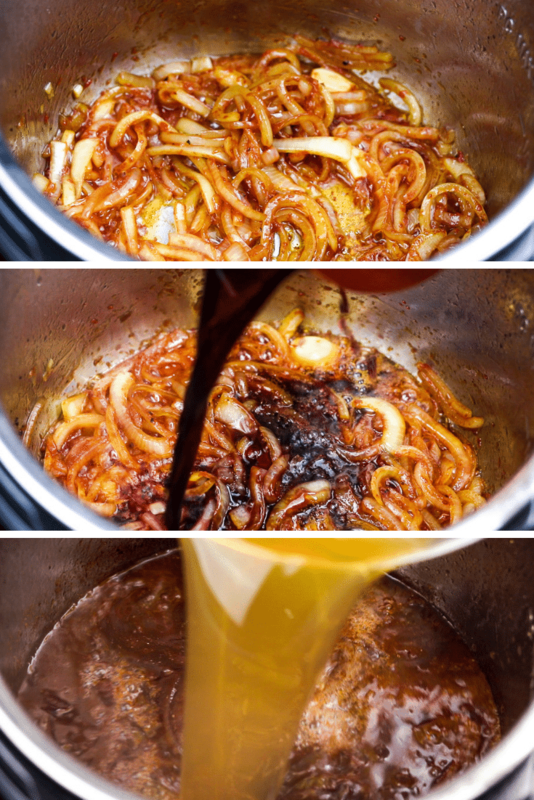 The only difference is when you are done with cooking onions, reducing red wine, adding beef broth and the meat into the pot, cover the Dutch Oven with the lid and bring it to boil. Then transfer the pot to a preheated oven and cook it for about 2 ½ hours at 300°F. When the meat is done, do all the same steps to make the red wine gravy. Wash and pat dry short ribs and season them with salt and pepper. Set Instant Pot to “Sauté” on high heat by pressing “sauté” button twice and add vegetable oil. Brown the meat in 2 batches for about 4-5 minutes on each side. Then remove from the pot. Add diced onion and sauté for about 8-10 minutes. Add garlic and stir in tomato paste. Cook for 2 more minutes. Add red wine and let it reduce in half for about 10 minutes. Add beef broth and carrots. Add browned meat, thyme, and rosemary. Remove the meat and the carrots. Cover with foil and let it rest. Pour the red wine sauce over the meat and serve. I can’t wait to try this recipe. You might re-write recipe or change picture of onions. You have diced onions in recipe and are showing sliced. So which are you supposed to use? I don’t have red wine. Is there anything else I could substitute with? Hi Kathy! You can substitute it with beef broth, though it wont taste the same…. The main rich flavor comes from the wine. I prefer to use Cabernet Savignon, as it gives the best flavor! If I use 2 1/2 lbs short ribs should I increase the cooking time? That looks really good. What a deep colour – I bet the flavour matches! I love the way you’ve served it up with the potatoes etc. Really yummy. Recently I’ve won the Instant pot and can’t wait to try many recipes. Lovely dish! 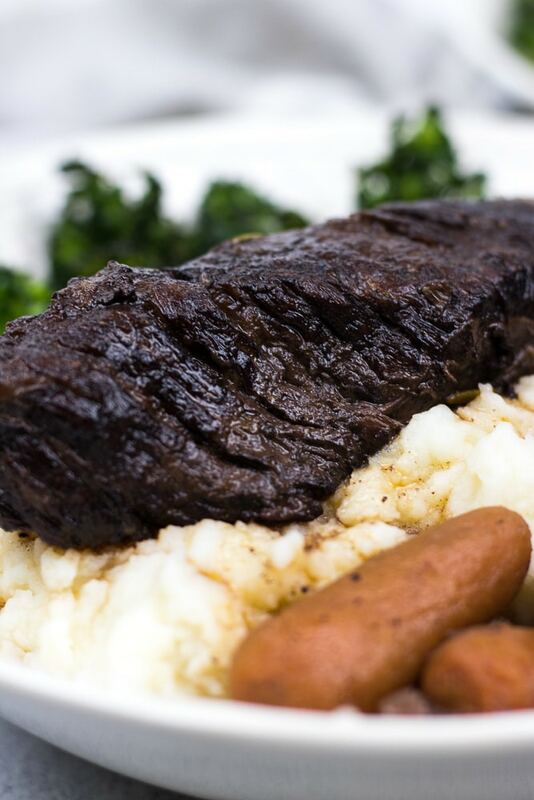 Your short ribs looks incredible…that entire dish looks incredible! I don’t have an instant sadly but my gosh was a fabulous meal! I seriously need to get an instant pot! Even just to try your short ribs recipe. They look fantastic! I’ve really been enjoying cooking in my instant pot since I bought it. Some people question why cook everything in IP, i’d say it’s convenient! 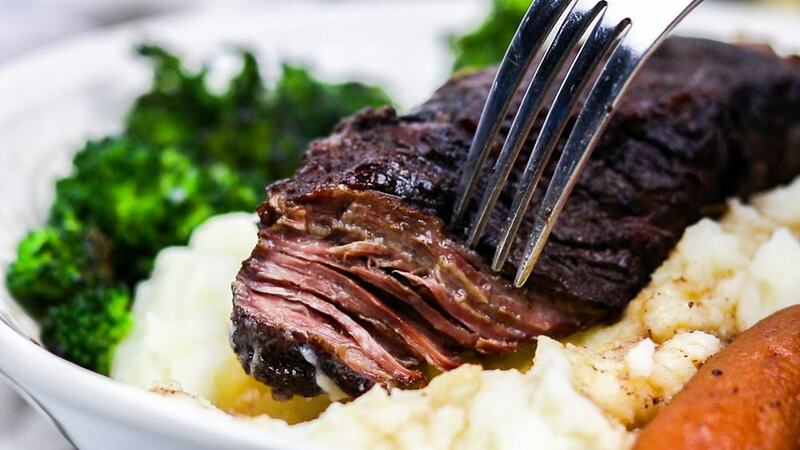 These short ribs looks absolutely great. I’m going to have to try out my Instant Pot on this recipe! So far I haven’t been convinced that my Instant Pot is as amazing as everyone says but maybe making these short ribs in such a quick amount of time will show me otherwise! Thanks for sharing your recipe!